After searing pressure from campaigners all over the UK, the government finally conceded £400 million to replace Grenfell-style cladding on tower blocks. 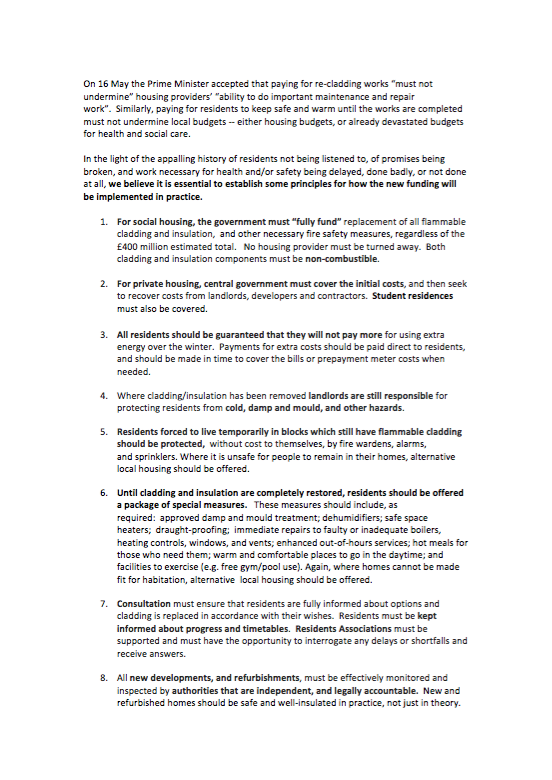 Whilst this is a step toward justice, it is not enough to make buildings fire-safe and does nothing for private tower blocks, student residences, buildings under 18M high, schools, hospitals or workplaces. There is every sign that only a few buildings will be fully re-clad before next winter – with works finished on one in ten public sector buildings since June 2017. 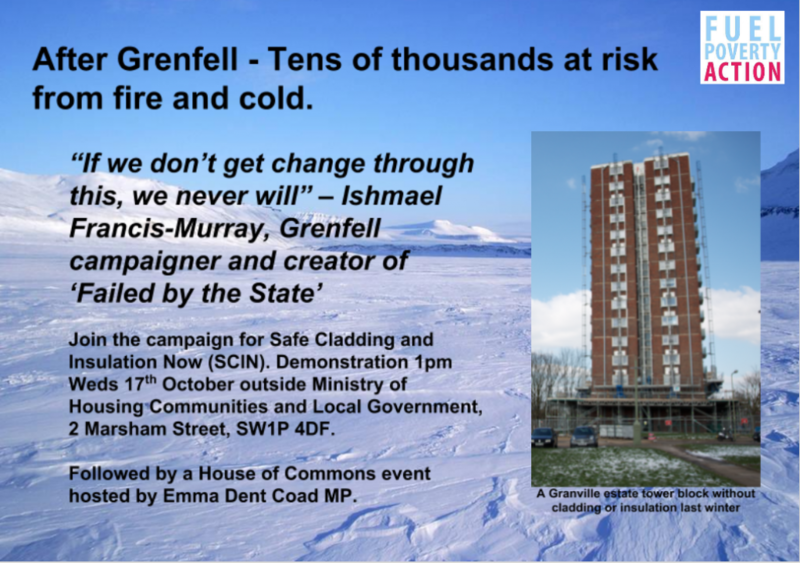 Last winter residents left without cladding or insulation were freezing in their homes. More will face cold and damp this winter and the next, if nothing is done. Cold. like fire, kills. 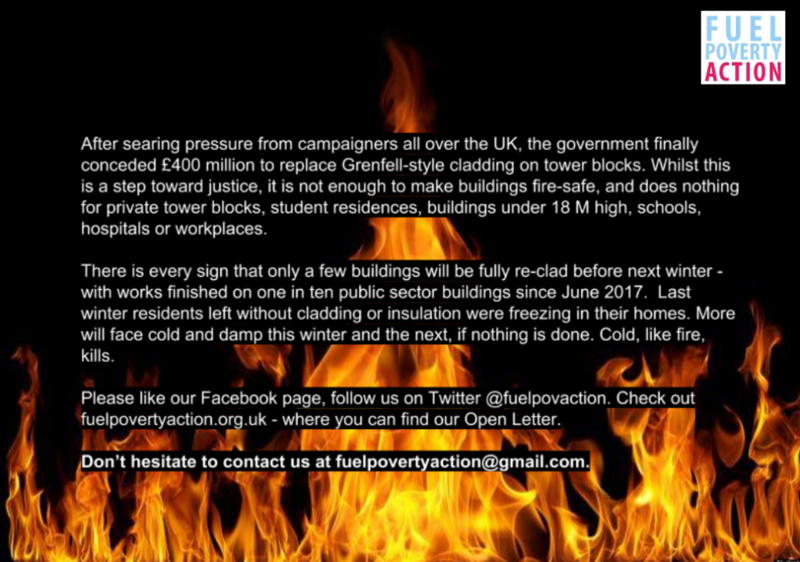 Join the campaign for Safe Cladding and Insulation Now. 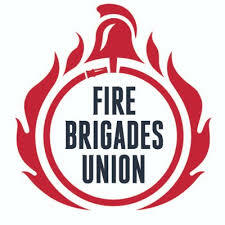 Demonstration at 1pm, Wednesday 17th October outside Ministry of Housing Communities and Local Government, 2 Marsham Street, SW1P 4DF. Followed by a house of commons event hosted by Emma Dent Coad MP. 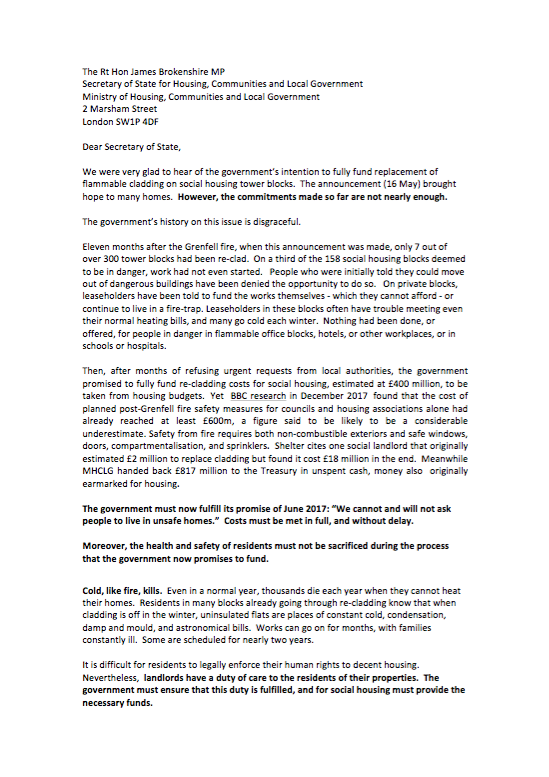 Please read our Open Letter to the Secretary of State which highlights our demands. If it would be useful to print off this flyer there are some options here. Earlier this summer, residents of the Salford tower block, Spruce Court, asked to meet Grenfell survivors, and we organised for them to meet with Grenfell United, along with other residents of dangerous high rise blocks. The Grenfell community has long insisted on one legacy: no one else should suffer what they went through. They were instrumental in winning the promised £400 million to re-clad social housing, but are now forced to watch this work proceeding at a snail’s pace. Residents of hundreds of buildings like Spruce Court continue to live with the same dangerous structures, materials and policies that destroyed so many lives, and, like Grenfell residents over the years leading up to the fire, continue to be ignored. You can read the full guardian report of the link between these two flammable towers here. 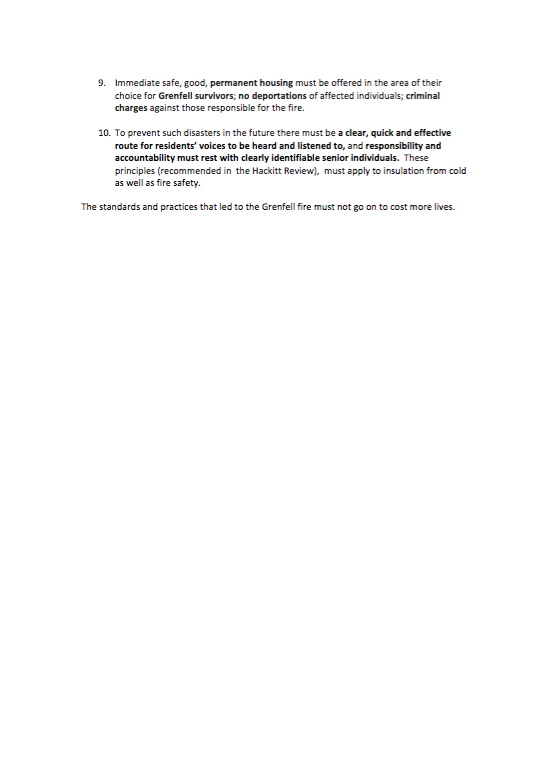 Below is our own comparison, the “Mirror Document” which helped to spark the Guardian report. There are many more buildings that still “mirror” Grenfell Tower as it was.